The various containers in this area provide examples of common vegetables, fruits and herbs that can be grown successfully in containers. We also demonstrate different types of watering systems, which are crucial to having success in containers. 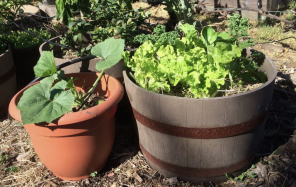 There is drip irrigation, self-watering containers and a modified clay olla system. There is a handout available about container gardening in a box on our shed, and it is also available here.